I was diagnosed with stage IV lung cancer 6 years ago. During my lung cancer journey through diagnosis, treatment, and recovery, I learned just how terribly underfunded lung cancer research is. My life, and countless others, depend on research to find new therapies to keep lung cancer at bay. This year, I was part of a team of survivors and advocates who decided they wanted to do something different to raise awareness for lung cancer and get Congress’ attention. It was one of the most rewarding things I’ve ever done. Just 5 weeks ago, a group of nine women from six different states were ready to make a change and the Life and Breath Rally was born. Our goal? To get lung cancer declared a national emergency and to double the funding to the Department of Defense’s Congressional Medical Research Program for Lung Cancer until the deaths from lung cancer are cut in half. 433 Americans are dying each and every day from lung cancer. That is equivalent to a jumbo jet crashing every day, yet where is our media attention? This is unacceptable! We are tired of being stigmatized, ignored, and underfunded. We want to use our voices for the past, present, and future lung cancer warriors. Too many are dying. All the organizers had been advocates in some way, but none of us had ever organized something of this size, let alone a rally on the Capitol lawn in Washington D.C. We contacted everyone we’ve ever met that could help us spread the word. There were several other dedicated advocates that helped us in so many ways. This was a team effort that never would have happened without them. 150 people had registered on our event page by the morning of November 2nd and we were praying at least half of them would show up. Not only were there 161 people at the rally, some of them flew from as far as Washington state, and others drove 8 hours from Michigan. Several members of the major organizations were there to support us too. We were honored to have six members of Congress speak to the crowd about the importance of funding this research. They were all very vocal about the urgent need for increased funding, and were dedicated to educating their co-workers in hopes of joining our cause. Congressman Rick Nolan (MN) was particularly instrumental in getting others to join us. His beautiful daughter, Katherine, has been fighting lung cancer for 3 years and she also shared her hopes and fears. People made shirts and signs and chanted with us, “What do we want? Research funding! When do we want it? NOW!” We felt empowered and strong as a group, even as several survivors there were on oxygen or were weak from treatment. For those 2 hours we were uniting together to fight for our community. Several survivors shared how lung cancer has affected their lives and without new treatments they will most likely die. This was not for dramatic effect – it is the brutal truth. Finally, we read 433 names of family and friends that have died from lung cancer. People were texting and calling us, saying “Please add my dad, mom or friend’s name to the list” just a few minutes before the rally began. In addition to the rally at the capitol, we had about 140 “virtual participants” who watched the rally live on Facebook. They commented on how special and impactful it was. I cried hearing several of my friend’s names because sadly, there are so many it’s hard to think of them every day. We handed out 433 small, white flags and asked them to write names of someone they lost. It was very moving to see people pause, and lay them on the grass as the names were being read. This brought tears to my eyes as I laid one down for my grandma. 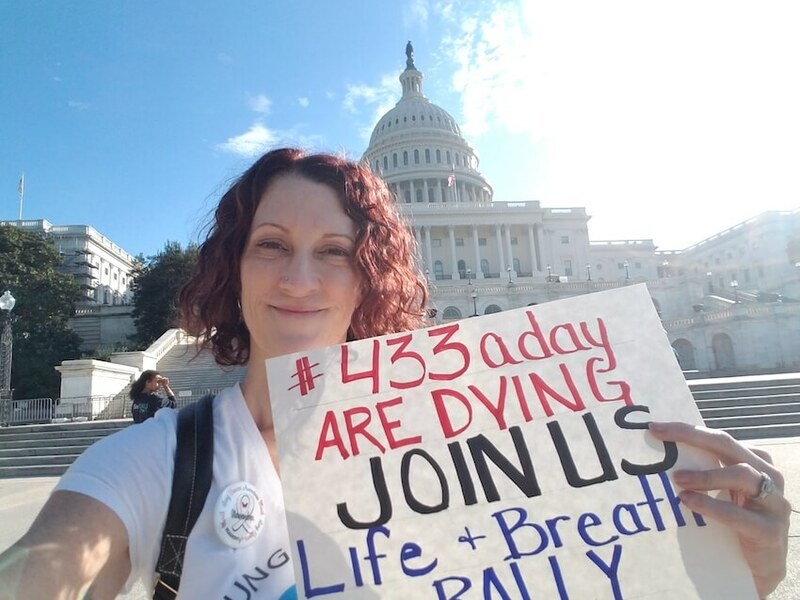 To show the impact of how many people die each day from lung cancer, we did a die-in to represent the 433 people who die each day from lung cancer. We laid down on the damp grass in front of the Capitol Building for 30 seconds of silence. This, too, brought tears to my eyes. It was too many “deaths” to see, even though we only had a third of the actual number of daily lung cancer deaths. At the end of the rally, we gave leave-behind folders to all attendees to take to their state representatives’ offices. Now that we were fired up, it was time to take action. We will not be silent anymore. We are fearful of dying and desperate for more research, but together we are also strong, hopeful and full of grit.